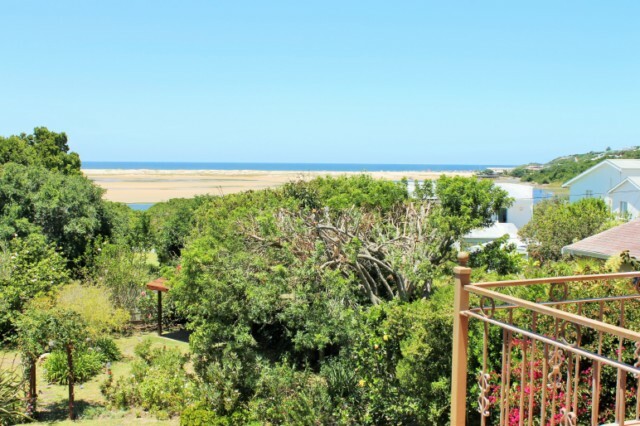 LOCATION: Poortjies, ± 5 walk to lagoon (50m) , ± 5 minutes drive to town and just around the corner from Market Square. Access point to nearest beach (Lookout) is only a 900m walk. VIEW: Well-maintained gardens, Beach & Lagoon. Modern, spacious fenced-in double story house. Downstairs houses the very large well equipped kitchen with hatch inter-leading into dining area (with fire-place) which opens onto covery verandah. French doors leading off dining-room into 5th bedroom ideal for children, bedroom opens out onto verandah. Verandah leads down into well maintained fenced-in gardens. Bedrooms 1 & 2 and Bathroom 1 & 2. Upstairs is a large TV lounge opening onto semi-covered balcony with dining area offer views, from which you can see the waves break. Bedrooms 3 & 4 and en suite bathroom #. 3. BEDROOM 2 (D/S): King en suite (bath with overhead & toilet) opening onto verandah. BEDROOM 3: (U/S): 2 singles opening ont balcony with views. BEDROOM 4: (U/S): King en suite (bath/shower/toilet). Bedroom 3 & 4 share a bathroom. BEDROOM 5 (D/S): this room inter-leadings into the dining room via French doors and leads out onto verandah, although not a bedroom per se it is fitted with 2 single beds and ideal for children, limited privacy. - Linen, bath & beach towels provided. - Mandatory housekeeper included in rental 3 days per week when booking is 7+ nights.